Earlier this week, after just two weeks since the unilateral termination of contract with Transstroi, the St. Petersburg Construction Committee selected new contractors for Zenit Arena. Metrostroi was one of three bidders (both others rejected) in an impromptu call for offers. The exceptional method gave contenders for the project only days to prepare their bids and raised serious concerns over legality from NGO’s and watchdogs. However, the Federal Antimonopoly Service (FAS) deemed the express call for offers as justified due to tight deadline ahead of the 2017 Confederations Cup and arguments of the investor who accused former contractor of delaying the project, among other charges. 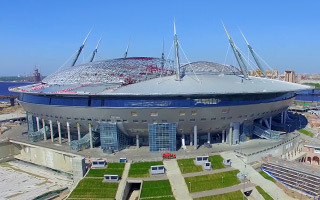 Now Metrostroi will finish all works at Zenit Arena, already beyond 85% progress rate, for RUB 5.38 billion ($83 million). Additional RUB 2.39 billion ($37m) has to be spent on reinforcing the west side of Krestovsky Island, where the massive stadium stands. While Metrostroi assures it would deliver the stadium within expected deadline (December 26, 2016), the sacked general contractor Transstroi is questioning chances to do so. According to the company, too many things are still unsettled (even final design documentation! ), though at the same time Transstroi assured it would do all it can to assure that Metrostroi can get to work as soon as possible. However, it’s important to remember that Transstroi was denied the regular proceedings that would see stocktaking and handover of the unfinished stadium. Instead, numerous subcontractors are working around the clock while the general contractor is expected to step down. Even with employment on site supposed to multiply under Metrostroi, the former contractor questions whether delivery ahead of the 2017 Confederations Cup is even possible. Transstroi announced going to court against the St. Petersburg Construction Committee (over the unilateral contract termination) and the Federal Antimonopoly Service (adding Transstroi to the list of untrustworthy contractors). Meanwhile the company is accused of numerous wrongdoings, including a deficit of 2.5 billion rubles at the construction site.